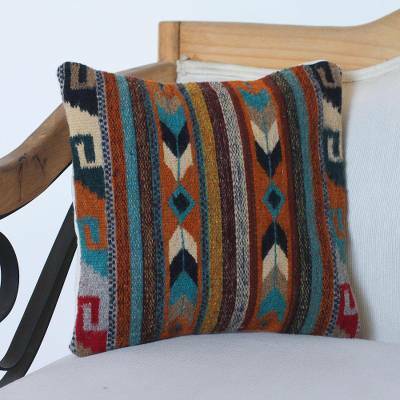 Handwoven Wool Cushion Cover Crafted in Mexico, "Earthen Colors"
In earthen and blue colors, stripes, chevrons, and spiral greca motifs decorate the front of this Mexican cushion cover. The Hernandez Lazo Family weaves the wool fabric by hand and colors it with natural dyes. A plain back of off-white cotton back has an opening to insert a cushion.